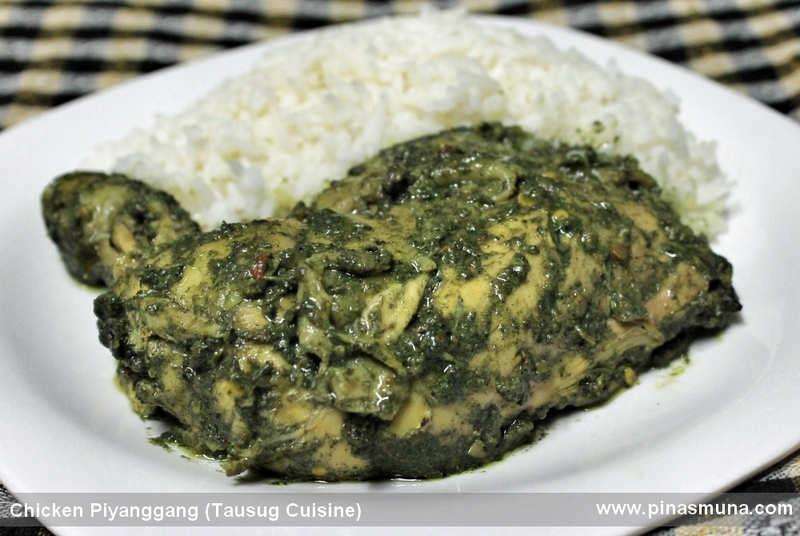 Tausug Cuisine is the cuisine of the Tausug people of the Sulu Archipelago, encompassing the provinces of Sulu, Basilan, Tawi-Tawi and the southern tip of the Zamboanga Peninsula and Palawan. 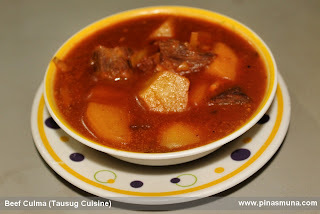 Due to its proximity to Malaysia and not being effectively occupied by the Spaniards, Tausug Cuisine has maintained its Malay origins characterized by the heavy use of spices, chili and coconut milk. Because the great majority of the Tausug people are Muslims, Tausug Cuisine strictly follows the Islamic Halal dietary law. 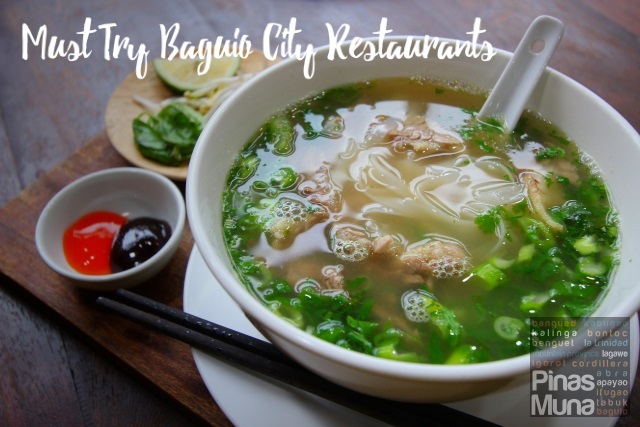 Below are selected dishes that best represent Tausug Cuisine. 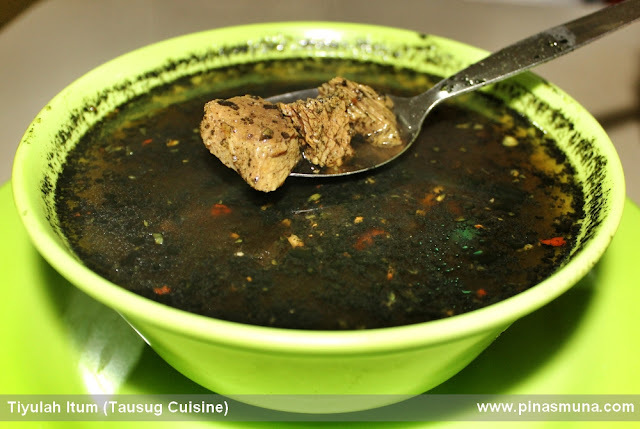 Translated as black soup, tiyulah itum is basically beef marinated with a paste made of burnt coconut (siyunug lahing), turmeric, ginger and lemongrass; sautéed with garlic and onion, and then boiled in water seasoned with salt, black pepper and chili pepper. For non-Tausugs, this dish may be compared to nilagang baka (boiled beef) sans the vegetables and spiced up with turmeric, burnt coconut and chili. Burnt coconut is the ingredient responsible for the black color of this dish and is an ingredient found only in Tausug cuisine. This spicy beef soup is traditionally served during special occasions or important gatherings. 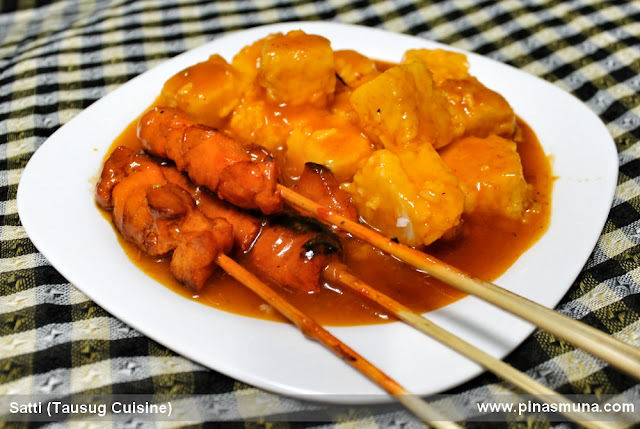 Satti is a meal of skewered beef or chicken served with steamed rice cubes (ta'mu) over a generous amount of a thick, orange colored, sweet-chili sauce (satti sauce). This is a favorite breakfast dish among Tausugs. Satti is the Tausug variation of the Malay dish satay. Similar to tiyulah itum, chicken piyanggang (or piyanggang manuk), is a dish prepared using burnt coconut paste giving it its distinctive black color. Chicken is sautéed with onion and burnt coconut paste. The meat is then cooked in coconut milk until the sauce thicken. Another way of cooking chicken piyanggang is to grill the chicken coated with the burnt coconut paste. Another Tausug favorite is the beef culma, a dish made of beef cooked with potatoes and carrots in curry and peanut sauce. We fondly describe this dish as a cross between kalderetang baka and kare-kare. With the migration of Tausugs to Metro Manila, they also bring with them their rich culture and traditions, including their cuisine. A number of restaurants and eateries now cater to the large population of Tausugs in Manila. 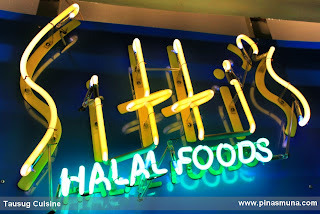 One restaurant in particular is Sitti's Halal Foods located in V-Mall (formerly Viramall), Greenhills Shopping Center. 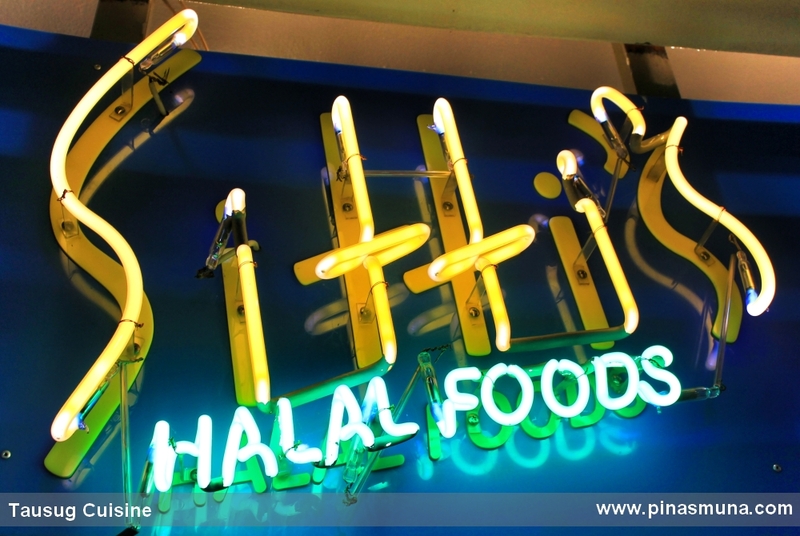 They serve authentic Tausug dishes and other classic Filipino dishes prepared using Halal meat. 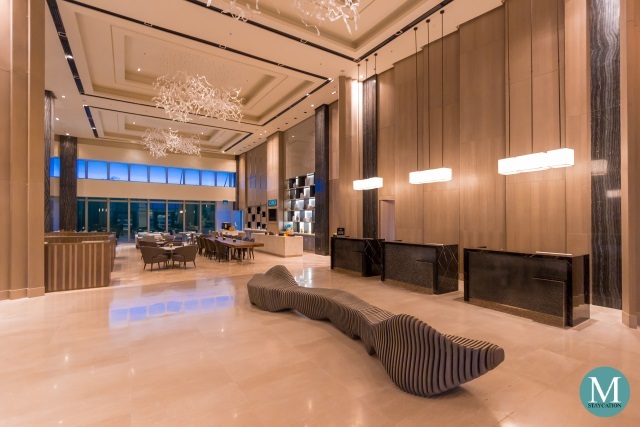 The restaurant is owned by a family from Jolo, Sulu and the kitchen staff are from Zamboanga and Tawi-Tawi. 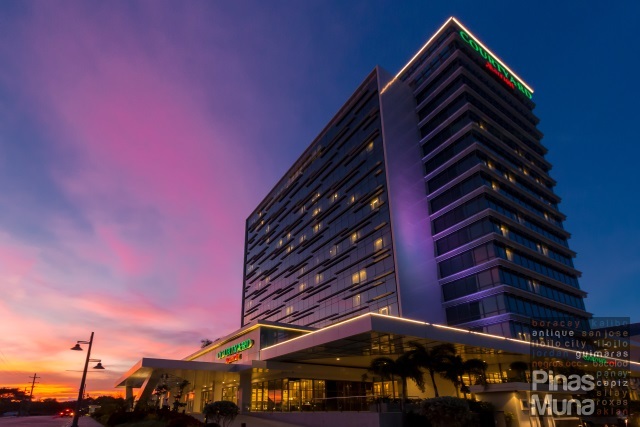 They primarily serve the Muslim community of the commercial complex and they welcome everyone who wish to sample Tausug Cuisine. 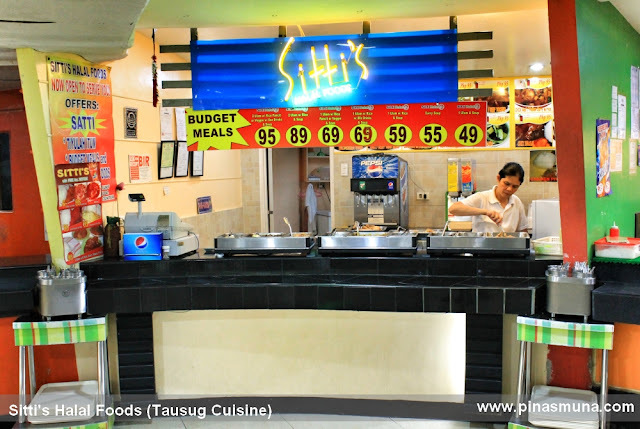 Their Tausug specialties are served with rice and iced tea and cost P95-P99 per serving.